Avast! International Talk Like a Pirate Day, September 19th, be right around the weekend wave so hold on te yer skull bandanas. It be hard te fathom a year has passed since I went searching the Etsy seas with me Fantasy Artists of Etsy crew fer Pirate Jewels and Treasure Maps te celebrate. Today I set me magical compass te point toward pirate costumes fer Halloween instead. Through me spyglass, I spotted these tricorn hats! They'll make ye or yer sea dog the proudest beauties on the ship. I was thinking about doing a Pirate family theme for Halloween this year! Love it. Absolutely better late than never to visit! My family is rather pirate-y, so we kinda enjoy this day. Stumbled Upon From Measuring Flower! I like those. I want one! Stumbled this. Love these hats! Stumbled for you. Mine is http://daybydayinourworld.com/2011/09/visiting-a-town-called-hope/ if you feel like checking it out. 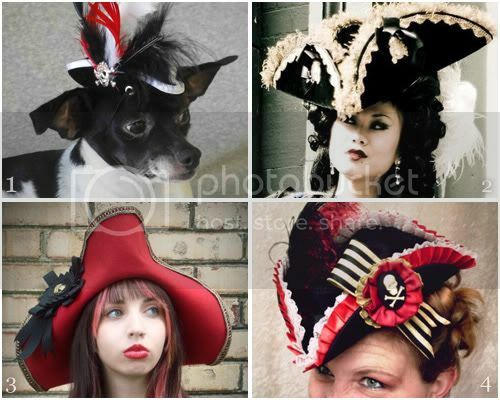 My son went through a pirate phase earlier this summer but never had anything as elaborate as these hats! These are high fashion pirates! The dog pirate hat is too much! I am visiting from the Stop and Stumble and have stumbled this post. If you have a chance and can stumble http://www.messforless.net/2011/09/color-drop-game.html that would be great.